Hippocrates, “the father of medicine”, uttered the famous words, “Let food be thy medicine.” How far the medical mentality has since strayed from those words! However, the concept has not changed and today amazing results of glowing health are being realized by those who embrace the raw food diet as a lifestyle. I say lifestyle because a diet alone will not keep one healthy nor heal a person. Rather, it’s a package deal encompassing healthful habits, and lifestyle. When I speak about healing however, it must be clear that it is the body alone that heals itself, not food nor any other outside source. This does not negate the need to eat healthy. The body has the ability to self-heal but we need to help it along by providing it with the proper nutrients. The body can be likened to a car engine and food to fuel. The car needs fuel to burn to work properly and get you around to where you need to go. If your vehicle uses diesel gas and you put in regular, the engine will not function optimally; it may be sluggish, having little power and may even produce foul smoke. The point is, it must have the correct fuel to have peak performance. The same is true for humans. When we eat foods that are not compatible with our digestive system our energy levels decrease, we feel tired and food will not be digested properly to provide the nutrients (or fuel) our bodies need to create ideal health. If we want to have high energy levels, optimal health, high stamina, clear minds, glowing skin, etc., we need to provide our bodies with the correct fuel (food) for which we were designed. What Were We Designed to Eat? The diet we were designed to eat is made up of fresh, ripe, organic, and raw fruits, vegetables, nuts and seeds. These foods alkalize our body, which is so important for providing oxygenation. When we cook food it reduces the oxygen that is normally found in fresh food, and oxygen is essential in resisting disease. When you cook food at temperatures higher than 118 degrees, the vital nutrients, enzymes, minerals, vitamins, etc. are lost. In fact, up to 85% of vitamins and minerals can be destroyed in the process. Enzymes, which are the spark plugs of life, aiding in digestion and health, are destroyed forcing the body to produce more digestive enzymes than it was designed to. Eating only cooked foods you use up your enzyme producing capacity causing increased tiredness and aging. Eating raw, fresh foods not only spares the body of depletion of this limited enzyme potential, but it provides maximum nutrition filled with rich vitamins, minerals, etc. In fact, the body utilizes live enzymes and nutrients from raw food to enhance our vitality, tissue regeneration, body detoxification and self repair. Many have healed from so-called “incurable” ailments on the raw food diet from diabetes, arthritis, fibromyalgia, cancer, asthma, and gastrointestinal disorders just to name a few. I can attest to the amazing health benefits of living the raw food lifestyle (click here to see my journey to health). Having suffered severe pain and fatigue for years from fibromyalgia I saw instant results in decrease of muscular and joint pain, energy levels began to soar, and my digestion improved, to name a few. Besides healing physical ailments, you will notice on a mental level that you have a sharpened memory and higher concentration level. That mental fog you may have once experienced will be lifted, you may even find yourself with more creativity and just feeling clear-headed being able to make decisions with clarity. Emotionally you will notice such an increase in positivity. Children with hyperactivity have also been known to be calmer and focus better. These are all a result of the fact that live foods feed and nourish the body richly. So the body no longer has to expend all its energy to rid itself of toxins from the Standard American Diet (SAD). It can focus on making or keeping you healthy! Just when you think it sounds too good to be true there is more! Raw food enhances your beauty. Most raw fooders (those who eat at least 75% raw food) have a radiant glow about them. The skin just glows, cellulite vanishes, puffiness on the face or body disappear, extra pounds melt away and you just have an overall glowing energy about you. Last but not least, a raw food diet will save you time and money. There is much less food preparation before the meal and no greasy, sticky pots to wash after! You will save money on junk food and processed foods that you no longer buy. Plus, with all those live nutrients you’re getting from your food you will feel satisfied because your body isn’t starving for the nutrients it was lacking on a cooked food diet, leaving you feeling hungry. These are just some of the wonderful results of eating raw foods. I encourage you to start at your next meal. Simply start adding in raw foods into your diet and see for yourself how it changes your life! I would love to have glass straws as I am currently using plastic. While they are BPA free I much rather enjoy using glass! The results sound too delightful not to atleast try. I don’t even like cooking let alone cleaning. If I never washed another sticky pot, thank you God. I love fresh fruits and veggies so I will be glad to buy more. I am getting involved with a new farmers market and this sounds like just the path to go. I am very excited, thank you so much for the inspiration young lady !!! So excited to hear that Chris! We have something in common I don’t like to cook either, let alone clean sticky pans, haha! The results of a raw food diet ARE amazing. Let me know if you have questions along the way. Wishing you the best on your new journey to radiant health! I am interested in incorporating raw food into my diet, but how do I start? which ingredients and kitchen tools should I have? I am so happy to hear that Victoria! And that is a great question. I would love to answer that question in full so I will email you shortly. Hi! I would love love to incorporate more raw foods in my diet too and experience all the benefits but I don’t know where to start either. Can you email me some tips too please. It is so nice to read about your journey. How your life changed and your healthy improved. I am switching to raw but it is very overwhelming for me. I am suffering from ED and atopic exema. I am dancer so I need a lot of energy and it is for me hard to get enough from fresh fruit and vegies especially when I have to perform streight immediately. If you can give me some tips which helps you to transit to this nice lifestyle. Thank you very much. I’m so glad to hear from you! I know just how overwhelming it can be in the initial transition.One of the most important factors is that you eat enough calories, this is not a diet of calorie or carb counting/restricting it’s a diet of abundance so that’s the good news! Especially as a dancer this is very important. 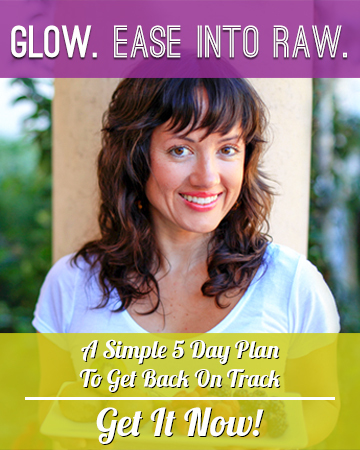 For starters I invite you to sign up for my newsletters,this way you’ll receive my free ebook ‘Glow Raw’ for a day giving you my tips on how to start. I also have resources here on my website with many posts explaining more. Here are a couple links https://justglowingwithhealth.com/9-tips-for-transitioning-into-raw-foods/,https://justglowingwithhealth.com/how-to-stock-a-raw-kitchen/ and I even share my tips for transition in a youtube video here. I hope that helps! I wish you the best in your journey and if you’d like to get more questions answered in detail feel free to email me I offer free initial consultations so we can set up a time to talk.